Seneca’s Mike Ginyard, takes the ball to the basket against Triton during the fourth quarter of the South Jersey Group 3 tournament first round game. Seneca won, 51-45. By his own admission, Mike Ginyard sometimes plays things a little too cool on the basketball court. His coach pleads with him to be more selfish, to take more shots. His teammates urge him to be more aggressive. Ginyard, a senior swingman for Seneca, doesn't argue. There are times he joins the chorus. "Sometimes, I ask myself the same question," Ginyard said of his own occasional lack of assertiveness. On Monday night, Ginyard led the way as Seneca beat Triton, 51-45, in the first round of the South Jersey Group 3 tournament. 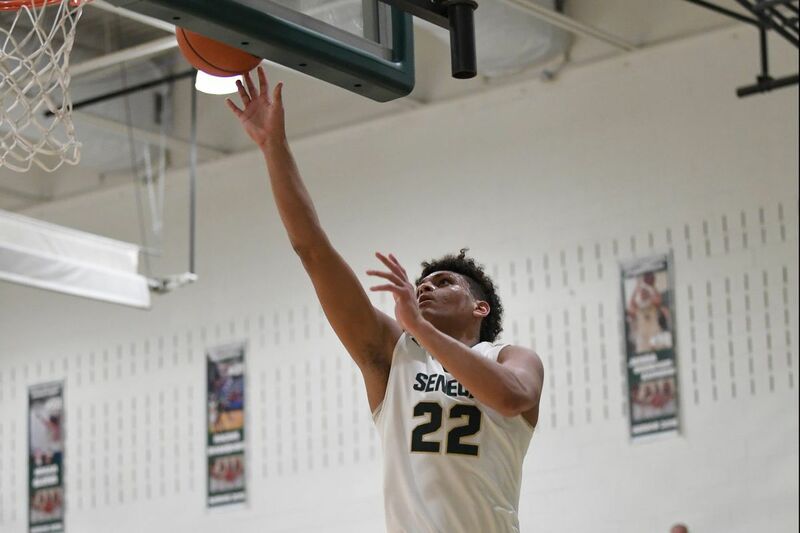 The 6-foot-4 Ginyard led all scorers with 23 points, made five three-pointers, and saved some of his best work for the fourth quarter for second-seeded Seneca (15-12). Senior guard Jack Brockett added 14 points with six assists for the Golden Eagles, who will host the Cumberland-Highland winner in a second-round game on Wednesday night. "It's huge for us because we haven't had a lot of these [playoff wins] at Seneca," Ginyard said. "When it was over, when we won, it was such as relief." Senior swingman Jalen Collins scored 17 with eight rebounds in his final game for 15th-seeded Triton (10-15). The 6-foot-6 Collins was limited a bit by foul trouble. He also was the focus on Seneca's defense, including a diamond-and-one alignment in the first half. "Jalen was such a worry," Seneca coach Sean Kennevan said. "Man, he's such a beast. Our game plan was to limit how many times he touched it, how many times he shot it." Brian Rinaldi and Colin Taylor each scored eight for Triton, which built an 11-point lead in the first half and still led, 38-37, entering the fourth quarter. "Our kids played so hard," Triton coach Andrew Canzanese said. "Jalen did what he could. They were aggressive, they put some pressure on our guards, and our turnovers and their offensive rebounding really hurt us." Brockett made a reverse layup and added the free throw for a three-point play that gave Seneca a 40-38 lead with six minutes, 18 seconds to play. "This is it, senior year," Brockett said. "Everyone is locked in." Ginyard's fifth three-point jumper gave the Golden Eagles a 43-40 lead at the 5:32 mark. He added a big bucket for a 48-43 lead with three minutes to play. "Mike is the most humble kid on the team," Kennevan said. "He never wants the spotlight. I've been begging him to take the spotlight and he took it tonight." Brockett said Ginyard was the difference in the game. "It's huge for us to get Mike going," Brockett said. "When he goes, we go. He carried us tonight." In typical low-key fashion, Ginyard slipped out of the locker room after the game and was out of the building as fans milled around the court in celebration of a postseason victory. Brockett called Ginyard on his cell phone. "Mike, get back in here," Brockett told him. "People want to talk to you." Ginyard returned and vowed to continue to assert himself for the rest of the Golden Eagles' playoff run. "This is it," Ginyard said. "I have to leave it all on the court." T: Jalen Collins 17, Donovan Beatty 5, Garrett Ouimette 4, Colin Taylor 8, Brian Rinaldi 8, Tom Klein 2, Kenny Hands 1. S: Jack Brockett 14, Mike Ginyard 23, Malin Jasinski 5, Johnny Kennevan 2, Nygee Kinlaw 3, Dane Kane 3, Nate Roseboro 1.